Several members of Congress are calling on the Trump administration to sanction China over human rights abuses against Muslim ethnic minorities in a new bipartisan letter obtained by ABC News. The push comes as the U.S. estimates that China has detained possibly millions of Uighurs and other members of Muslim minorities in detention camps or “re-education” centers in the country’s western Xinjiang region. The Uighurs are a majority-Muslim, Turkic-speaking ethnic group that mostly live in western China. While formally known as the Xinjiang Uighur Autonomous Region, or XUAR, there’s little autonomous about it, as it has increasingly coming under strict, police-state rule by the Chinese government. Long-oppressed by the government, Uighurs now live under a surveillance state that is using tools like facial recognition technology and internment camps. China has dismissed growing international concern, saying they are conducting a legitimate government operation to combat terrorism and crime. The U.S. has voiced concerns about the situation, but critics say it must do more, like the human rights sanctions that several Republican and Democratic lawmakers are now calling for. 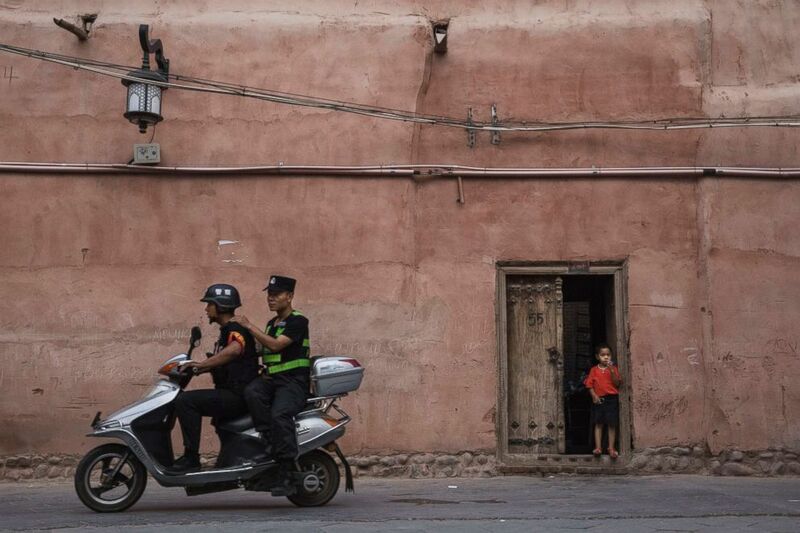 Police patrol on a scooter as an ethnic Uyghur boy stands in his doorway,June 27, 2017, in the old town of Kashgar, in the far western Xinjiang province, China. The Global Magnitsky Act gave the White House authority to sanction foreign government officials for corruption or human rights abuses. Its deployment against China has reportedly been under consideration for some time, with Acting Deputy Assistant Secretary of State Laura Stone saying in April that Global Magnitsky sanctions were among the many options the U.S. was considering. A State Department spokesperson later added, “No region is immune from human rights abuse or corruption,” but declined to comment on any investigation or plans. According to the letter, which was organized by the bipartisan Congressional-Executive Commission on China and its chair Sen. Marco Rubio of Florida, and co-chair Rep. Chris Smith of New Jersey, that crackdown has targeted Muslim minorities for even the simplest displays of their religion in public or for communicating with family overseas. In the internment camps, detainees are forced to learn Chinese, watch propaganda videos, and renounce their ethnic identities and religious beliefs, according to U.S. Ambassador Kelley E. Currie, the representative to the United Nation's Economic and Social Council. Muslims are targeted using what Currie called a “highly intrusive, high-tech surveillance system” that uses tools like facial recognition software, monitoring apps, GPS devices, tens of thousands of newly hired police, and compulsory collection of biometric data like iris scans and DNA samples. The letter, addressed to Secretary of State Mike Pompeo and Treasury Secretary Steven Mnuchin, points specifically to which Chinese officials and companies it says should be sanctioned. At the top of the list is the Chinese Communist Party Secretary for the region Chen Quanguo, who previously served in Tibet for five years and oversaw a similar crackdown there, according to the Jamestown Foundation, a foreign policy research group based in Washington, D.C., created to support Soviet defectors. 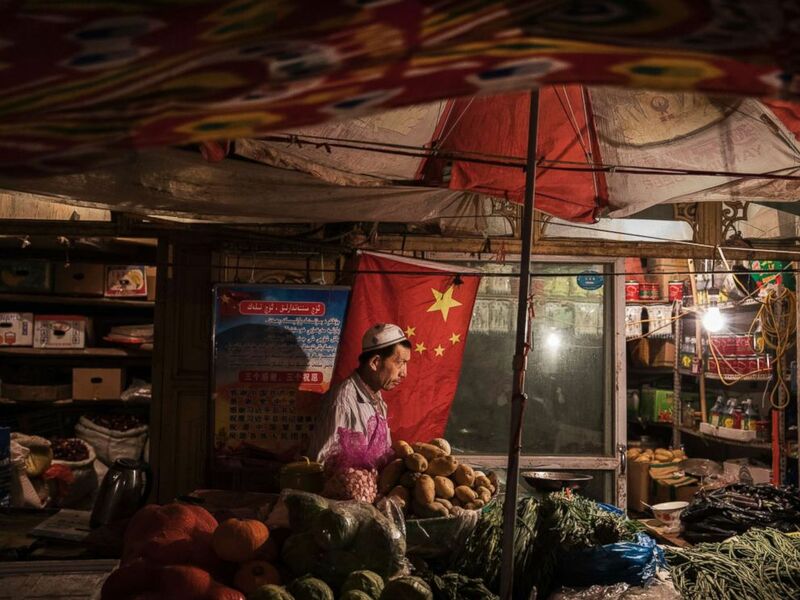 An ethnic Uyghur shopkeeper works next to a Chinese flag at his shop, June 29, 2017, in the old town of Kashgar, in the far western Xinjiang province, China. “No Chinese official or business complicit in what is happening in the XUAR should profit from access to the United States or the U.S. financial system,” the lawmakers write in their letter. Among the companies they call out are Hikvision and Dahua Technology, that have together been given a total of $1.2 billion in government contracts to help build the surveillance state in Xianjing. The letter’s signatories include close allies of the Trump administration like Republicans Marco Rubio of Florida and Tom Cotton of Arkansas, as well as leading Democrats like the Senate Foreign Relations Committee’s ranking member Bob Menendez of New Jersey, and former ranking member Ben Cardin of Maryland. That number echoed the findings of a U.N. human rights panel. “Upwards of a million people are being held in so called counter extremism centers and another two million have been forced into so-called re-education camps for political and cultural indoctrination,” said Gay McDougall, a member of the U.N. Committee on the Elimination of Racial Discrimination, also known as CERD. McDougall laid out the extent of the crackdown -- sweeping arrests without charges for even the simplest expression of ethno-religious identity, mass surveillance with mandatory collection of biometric data like DNA samples and iris scans, and the confiscation of travel documents, requiring people to apply for permission to leave the province. 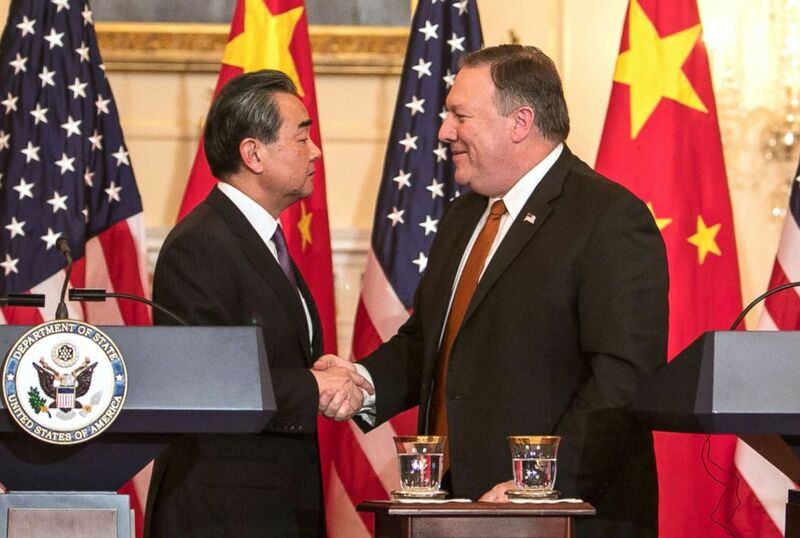 Chinese Foreign Minister Wang Yi and U.S. Secretary of State Mike Pompeo shake hands during a brief press conference in the Benjamin Franklin Room at the State Department's headquarters on May 23, 2018, in Washington, D.C. The region “resembles a massive internment camp that is shrouded in secrecy -- a sort of a no-rights zone ... [where] members of that Uighur minority group along with others that are identified as Muslims are being treated as inmates of the state based solely on their ethno-religious identity,” McDougall said.